Arbor Day? That’s about trees, right? I thought. This tree stands somewhere in Southern New Mexico. I have a lot of photos of trees, I thought. I could do a post on Arbor day and share photos of trees, I thought. 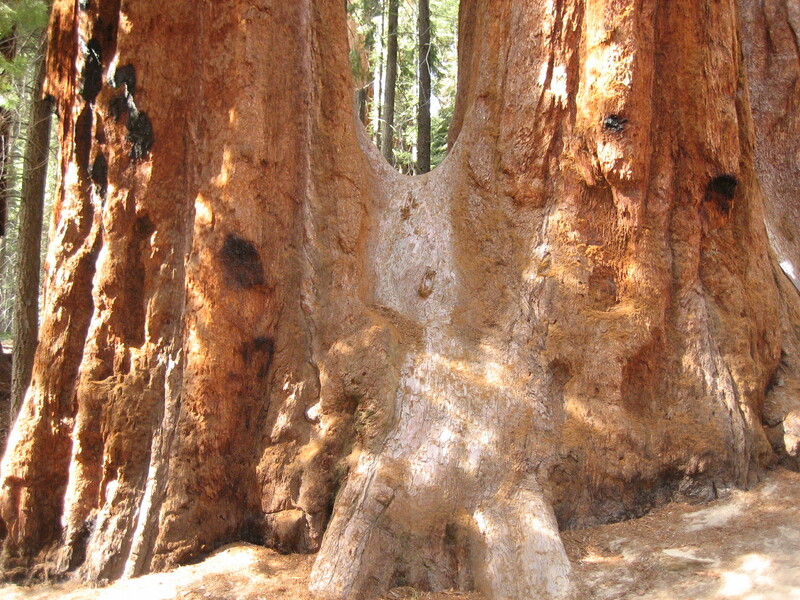 These giant sequoias live in California’s Sequoia National Park. Arbor Day is an annual observance that celebrates the role of trees in our lives and promotes tree planting and care. when settler Julius Sterling Morton proposed a resolution to the State Board of Agriculture. to the counties and individuals that properly planted the largest number of trees on that day. 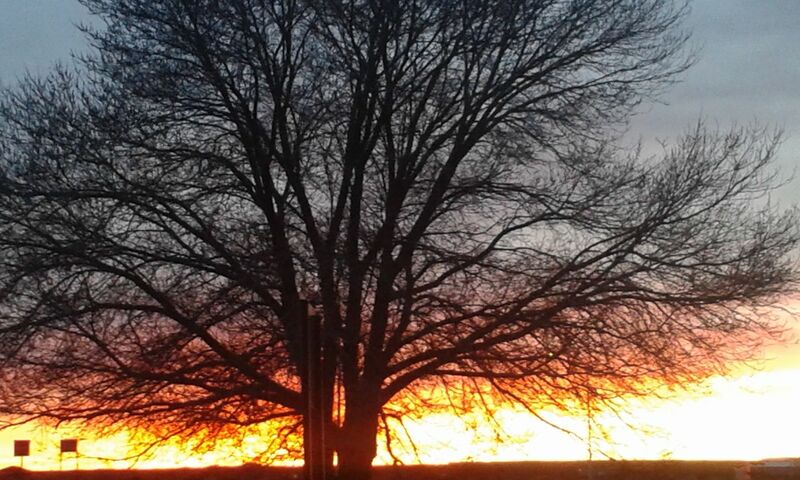 Nebraska was a largely treeless prairie region when, on April 10, 1872, it became the first state to celebrate Arbor Day by planting trees. A century after the holiday was first celebrated, the Arbor Day Foundation was created to continue encouraging people to plant and love trees, and President Nixon proclaimed National Arbor Day. Now the last Friday in April is National Arbor Day, which is when most but not all states celebrate it. 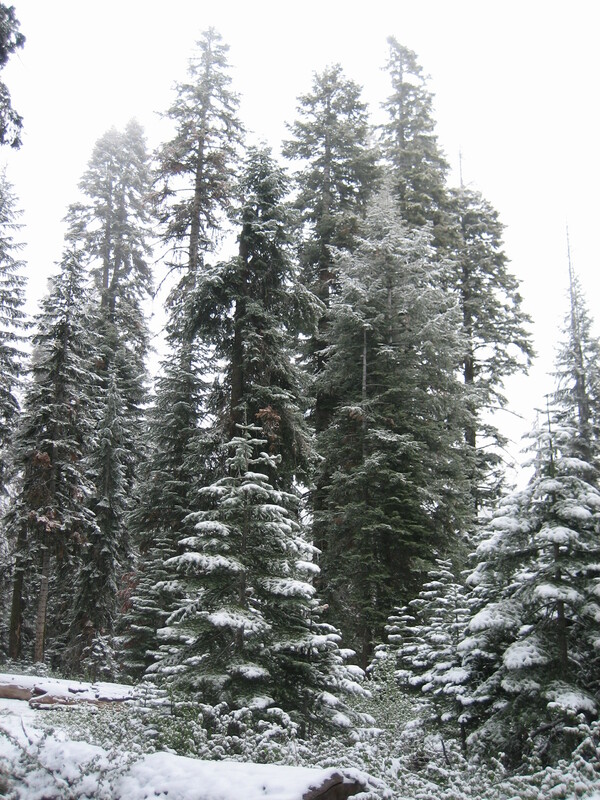 Evergreens in the snow in the mountains of California. Arbor Day (or Arbour; from the Latin arbor, meaning tree) is a holiday in which individuals and groups are encouraged to plant trees. Today, many countries observe such a holiday. Though usually observed in the spring, the date varies, depending on climate and suitable planting season. This tree in Northern New Mexico welcomes the night in the spring of 2017. I hope you have enjoyed this brief history of Arbor Day and these photos of trees. I also hope you can get out there and celebrate Arbor Day by planting one or more trees. 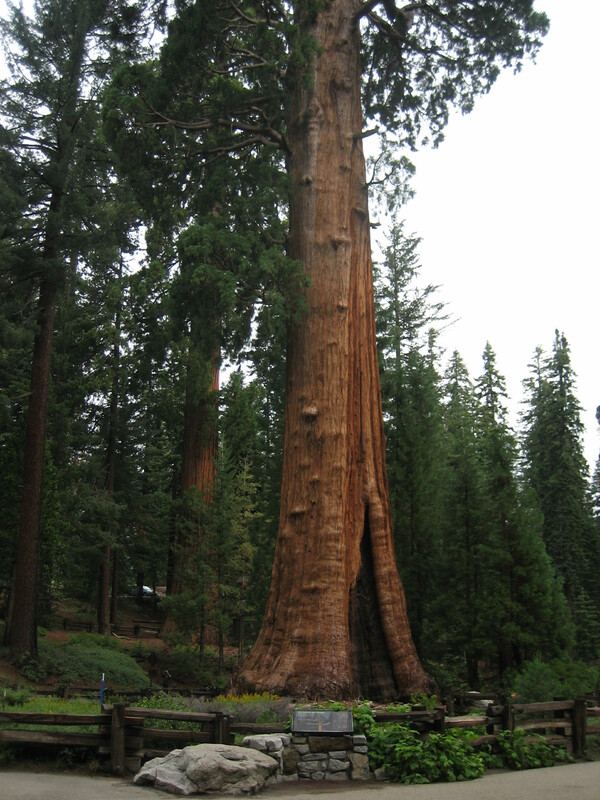 The General Sherman is not only the largest living tree in the known world; it is the largest living creature of any species in the known world. All of the photos in this post were taken by me. I left the mountain this morning. I won’t see it again for at least seven months. I didn’t sleep well last night. I hardly ever do before a big trip, but last night I was filled with worry. I was wide awake at 4:30 this morning. I went ahead and got out of bed and prepared to roll. Yesterday was foggy and drizzly at the campground. When I tried to open the doors on my van this morning, I had to give them an extra tug because they were a little bit icy and the ice was holding them extra shut. My windshield was iced over too. As soon as I got the door to the driver’s side open, I started my engine and kicked on the defroster. The ice was melted by the time the van was packed. The Big Boss Man sent me an email last night and asked me to stop by his trailer before I left this morning, so I did. He wanted to tell me that my name had come up twice at the company meeting he’d just returned from. I was the only non-managerial employee mentioned. Two highers-up in the company said what a great job I did in the mercantile this summer. They really want me to come back next summer, which means The Big Boss Man really wants me to come back next summer. He said when his employees do a good job, it reflects well on him. 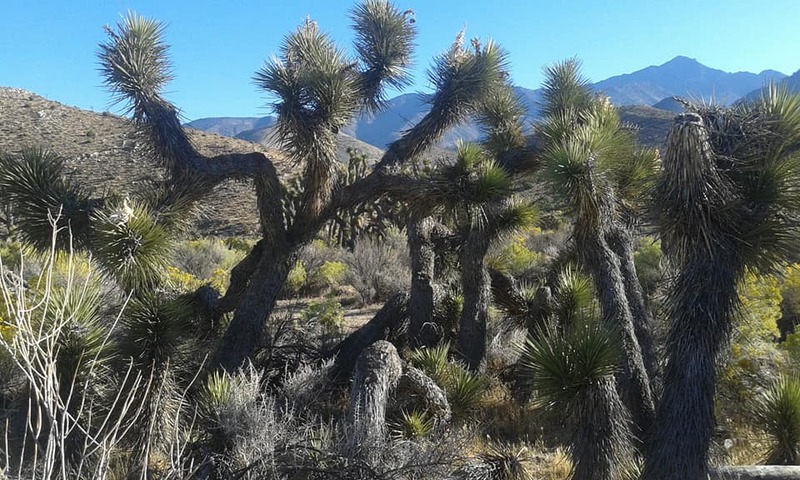 The highlight of my drive was a forest of Joshua trees. I’d driven through this forest in 2015 and have always regretted that I didn’t stop to take photos. Today I remedied the situation. Despite my worries of last night, my van and I made it fine to tonight’s destination. I did have to get a jump start in the truck stop parking lot. I drove through one of those safety corridors where drivers are supposed to turn on their headlights. I dutifully turned mine on, but forgot to turn them off. My laundry was almost dry when a man in the Subway portion of the truck stop asked who the van belonged to. When I said it was mine, he said, Your lights are on. Oh no! I rushed outside and turned them off, but it was too late. After folding my clothes and putting them away, making my bed, and tidying the van, I tried to start the engine, but it just wasn’t happening. The nice man parked next to me helped, much to my relief. I’m very tired, and I can’t wait for the sun to set so I can hunker down at the truck stop and get some much needed sleep. Tomorrow, my adventure continues. I’m happy to move on to something new, but as always, I’m going to miss those giant sequoias. I took the first two photos in this post. 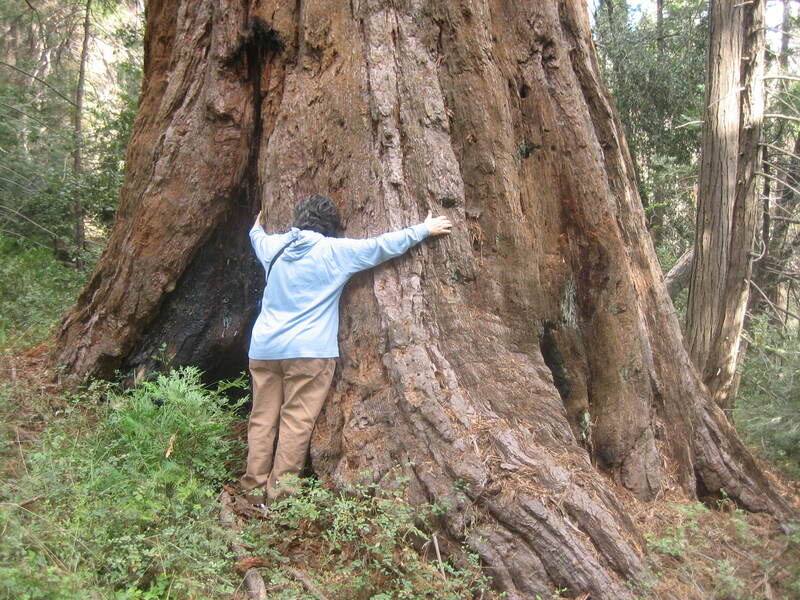 Photo of me hugging the giant sequoia by The Man. 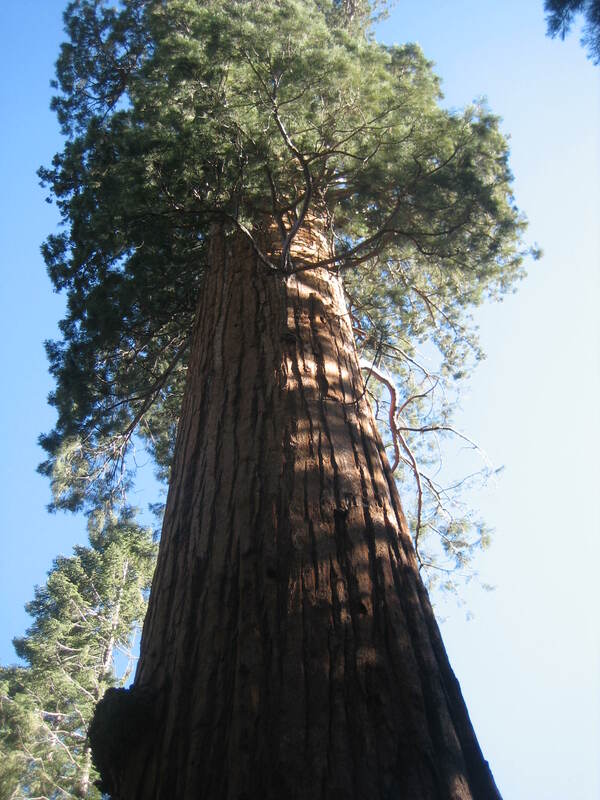 According to Wikipedia, the Stagg Tree is the fifth largest giant sequoia in the world. It is the largest giant sequoia in the Sequoia National Monument within the Sequoia National Forest, and the largest giant sequoia outside the Sequoia & Kings Canyon National Parks. in Alder Creek Grove in California‘s Sierra Nevada mountains. noticed the tree in 1931 and, with help from two others, made measurements of it in 1932. Amos Alonzo Stagg (1862-1965), a pioneering football coach at the University of Chicago who spent much of the last several decades of his life coaching in Stockton in the nearby San Joaquin Valley. Presumably the tree has grown in the last forty years and is even larger than these statistics indicate. The Stagg Tree grows on private land, but when I visited in the summer of 2016, the tree was accessible to the public. From Highway 190, turn onto Redwood Drive. (Redwood Drive is only on one side of the road, so you don’t need to know if you are turning left of right. Simply turn onto the road, which Google Maps also labels as 216.) When you get to the first fork in the road, stay left. At the second fork in the road, stay right to stay on Redwood Drive. At the third fork, stay left to stay on Redwood Drive. (If you take the right fork, you will be on Chinquapin Drive and you will be lost! If you do get lost, ask anyone walking around how to get to the Stagg Tree. The locals know how to get there.) I believe there is a sign pointing in the direction of the Stagg Tree at the last fork in the road. If I remember correctly, the pavement ends before the parking area. Keep driving on the dirt road until you see the sign that says you’ve reached the parking area for the Stagg Tree hike. After you’ve parked, you have to cross a gate to start the hike to the tree. The gate may be closed and locked, but unless new signs say otherwise, it is ok to cross the gate on foot and walk to the Stagg Tree. 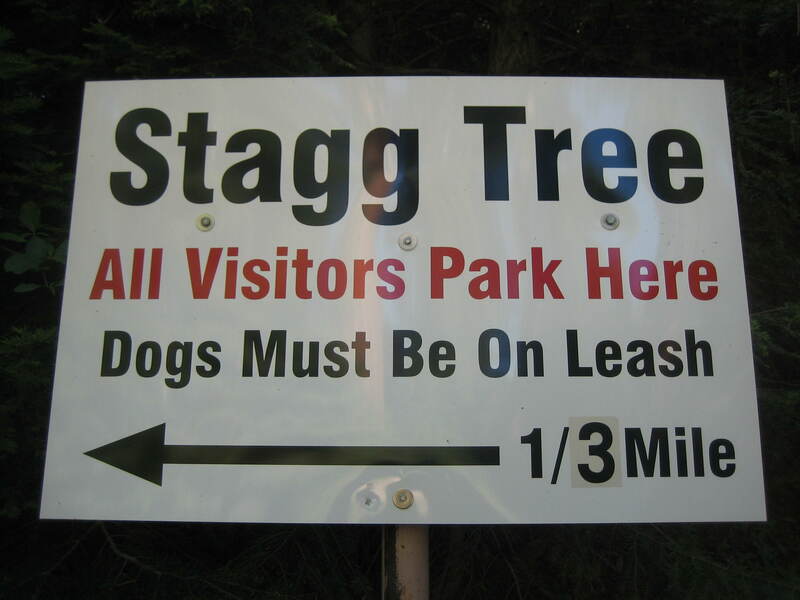 There are several signs along the path marking the way to the Stagg Tree. The walk to the tree is fairly easy. It is not wheelchair or stroller accessible, but healthy folks with no mobility issues should be able to get there and back with no problem. The path is fairly flat until the last fork to the left . The path that branches off from the last fork is a bit steep (downhill to get to the tree, and uphill to get back.) Again, folks with no mobility or health issues should be able to make it to the Stagg Tree and back with a minimum of stress. The Stagg Tree is not a heavily visited area. When I visited, I was the only person there. As I was walking toward the tree, another group was leaving, and as I left, another group was arriving, but I got the Stagg Tree all to myself for at least thirty minutes. I’m not sure why the tree is less visited than other attractions in the area. Maybe drivers are leery of making a drive taking them so far off the main highway. Maybe most tourists who aren’t big into hiking are hesitant to go on a infrequently populated, unpaved, slightly steep trail. Maybe folks who are regular hikers think the short, easy hike to the Stagg Tree is beneath them. In any case, I enjoyed my time alone with the Stagg Tree. It’s a great tree to visit to get away from the crowds and experience the sites and sounds of nature. Its size is quite impressive, and it’s fun to tell friends about seeing one of the largest creatures on the planet. I took all of the photos in this post. The Stagg Tree is the giant sequoia in all of the photos. 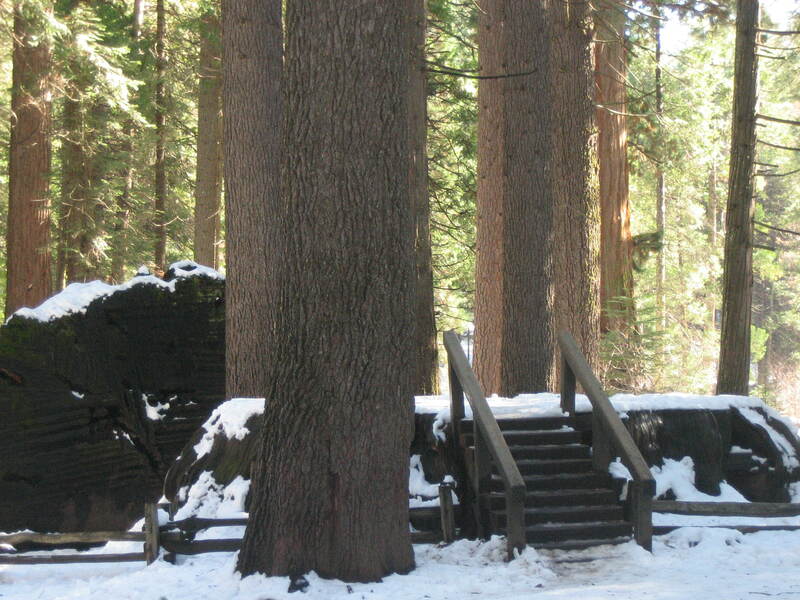 It wasn’t even winter yet, when I visited Calaveras Big Trees State Park. It was only December 1, but already ice and snow covered the ground. I hadn’t considered how a 1,500 feet increase in elevation can make a big difference in temperature and weather, so I was a bit surprised to see ice and snow on the side of the road as the van climbed above the 4,ooo feet mark. This is going to be fun, I thought. Luckily, I was properly dressed with hiking boots, jeans, a warm sweater over a long sleeve t-shirt, and my jorongo over it all. Thankfully, I remembered to grab some gloves before I left the van. 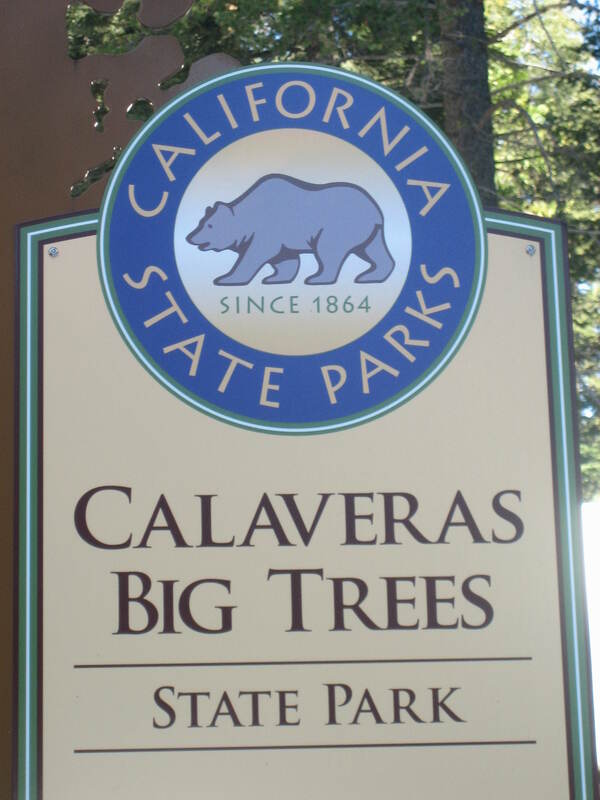 The Calaveras Big Trees State Park is proud of their trees. It costs $10 per vehicle for admission, unless you’re arriving in a bus. Buses carrying up to 24 passengers have to pay $50 for admission. It costs $100 to bring in a bus carrying more than 24 passengers. You can bet I’m going to inform people of these prices next summer when they complain about paying $5 to park where I work. I started my State Park adventure in the visitors center. The very friendly man who took my $10 at the entrance told me that’s where I could pick up a guide for the North Grove trail. The man didn’t tell me they want 50 cents for the guide. I hadn’t put any money in my pockets because I hadn’t planned to buy any souvenirs, and I didn’t think the trees were going to panhandle me. When I told the women in the gift shop area of the visitors center that I hadn’t brought any money in with me, she told me to pick up a guide from the metal box at the start of the trail. I took the guide that looked as if it had already been borrowed and returned. Upon seeing the guide, I understood why the park wants to collect some money for it. The guide is a booklet (not one page folded in three parts, which is what I think of as a trail guide due to what I’ve given out where I work), five letter size pages folded in half. The guide includes a lot of information. Before I took the guide and started my icy hike, I walked through the gift shop to the exhibit area of the visitor center. In the middle of the room was a display of taxidermied animals. I didn’t stop to examine them, as I don’t particularly like seeing animals killed so humans can look at them. I did look at the exhibits on the walls, which started with information about the native people who lived in the area before the miners and pioneers showed up. There was also information about the “discovery” of the trees in the park by white folks and the subsequent destruction of some of the largest ones. The stairs lead up to the stump of the Discovery Tree, planed smooth for dancing. [i]n 1853…[this tree] was stripped of its bark and felled by ambitious speculators. Since no saw was large enough, the tree was felled with…long-handled pump augers and wedges…It took five men 22 days to drill all the holes, but the perfectly symmetrical tree did not fall for several days. The stump was planed smooth to serve as a dance floor, and a two-lane bowling alley and bar were built on the fallen trunk. 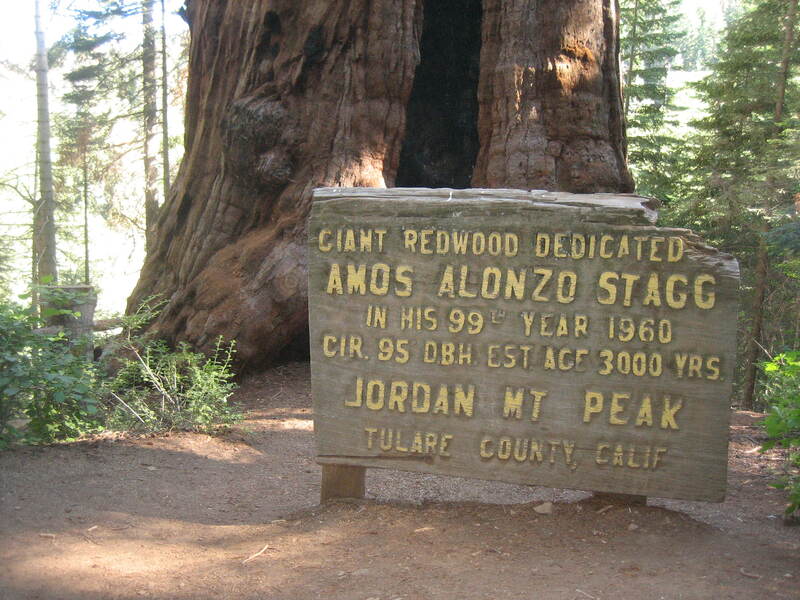 John Muir…was so angered by these events that he wrote: The vandals then danced upon the stump! This photo shows the fallen trunk of the Discovery Tree, upon which a bar and bowling alley were built. tree is. I climbed carefully up the icy steps and stood on the stump of the Discovery Tree. I felt very sad when thinking about this tree being killed by people who wanted to make money exhibiting its parts. The trail guide says the tree was only 1.244 years old when it was cut. 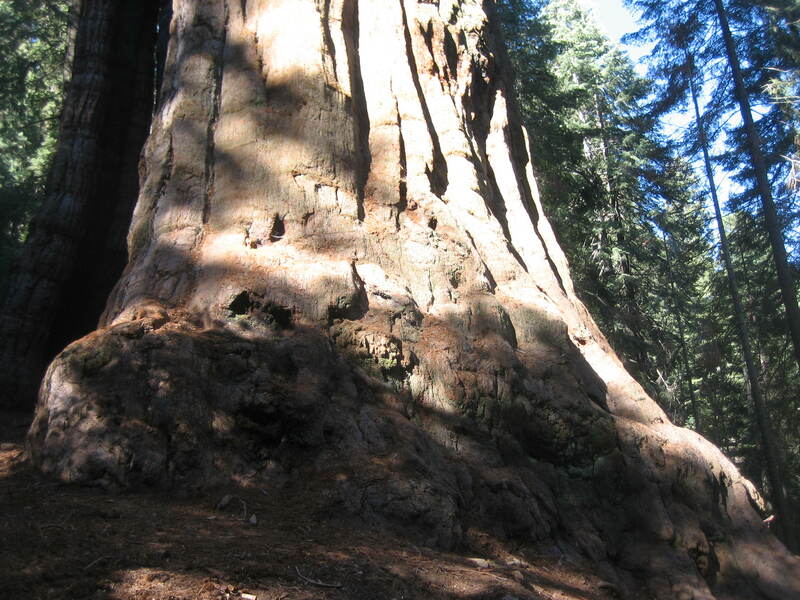 Since some giant sequoias live to be over 3,000 years old, the Discovery Tree may have had many more years of life ahead of it, had it not been destroyed in its prime. In 1854 the “Mother of the Forest…” was stripped of its bark. Promoters schemed to ship the bark strips back east for reassembly at exhibitions…A crew of men worked at the tree’s systematic destruction for ninety days…It was through the Mother of the Forest’s great sacrifice that a heightened awareness about the need to protect these trees was born. At the back of the exhibit area in the visitors center is a theater running a couple of documentary films on a loop. 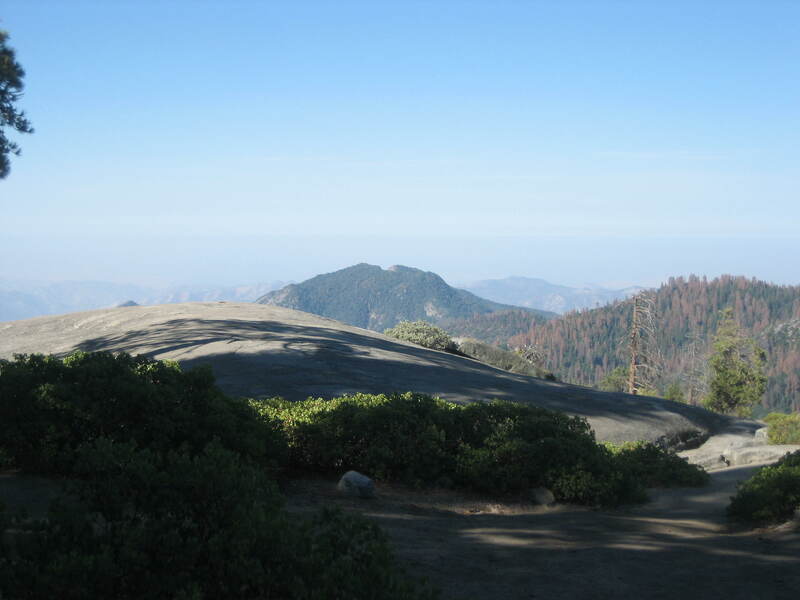 The films give a history of the park, including how the destruction of the Discovery Tree and the Mother of the Forest led to people working to protect the trees, including the creation of Calaveras State Park. After my time in the visitors center, I started out on my walk through the trees. I found the trail was covered in ice and snow: no clearing the trail or shoveling snow here! The trail was only visible because the snow had been packed down where people had walked. The packed snow in the middle of the trail had turned to ice and was very slippery. I wished I had remembered to carry my walking stick with me. To avoid the worst of the icy slippiness, I mostly walked on the edge of the trail, where the snow was still crunchy and my boots could gain some traction. Unfortunately, walking through the snow meant repetitively sinking up to my ankles. Still, I was glad I was there. I didn’t feel uncomfortably cold, and I enjoyed the extra quiet the blanket of snow brought to the forest. When the sun broke through the clouds and trees and hit the ice and the whole world shimmered, well, those moments were glorious. The North Grove of Calaveras Big Trees State Park is the sixth grove of giant sequoias I’ve visited. 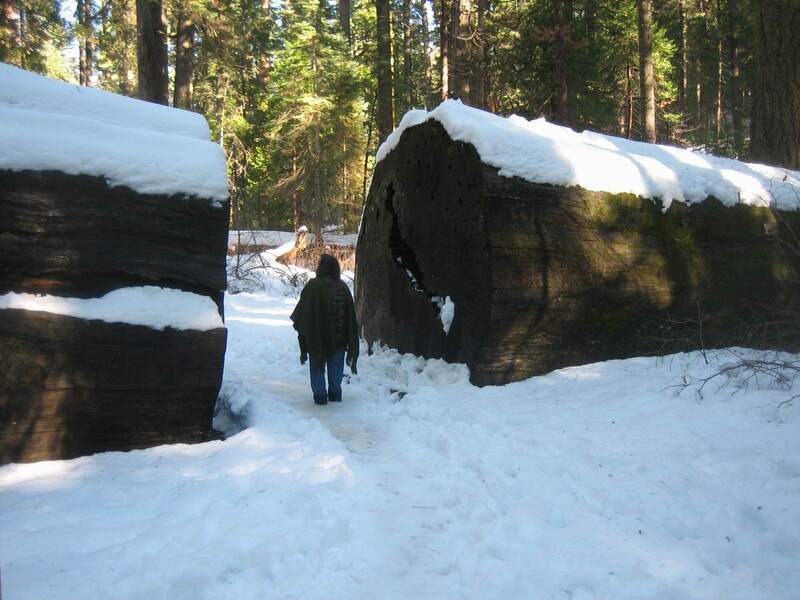 I think my trek through the ice and snow to look at new giant sequoias makes it official: I’m a fanatic! I was looking for a waterfall the day I found the George Bush Tree. the largest unlogged grove outside of a National Park. 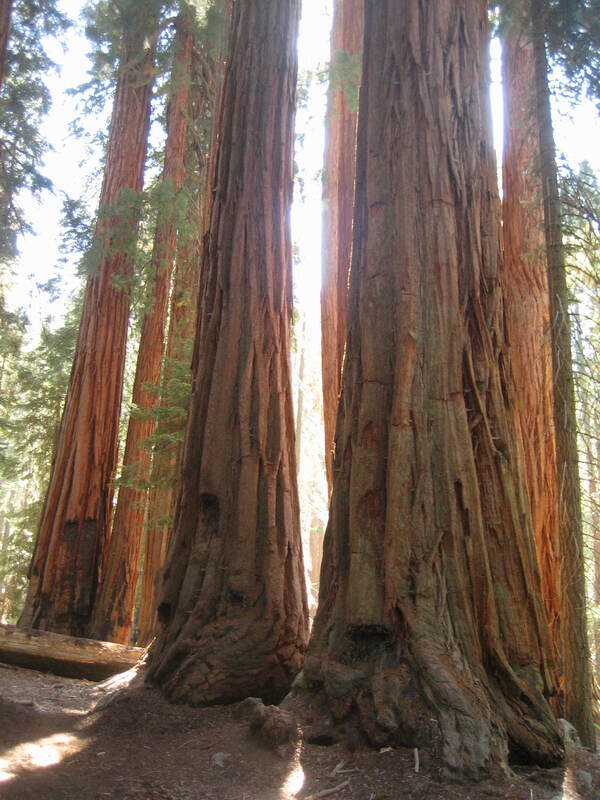 This grove is the easternmost grove of giant sequoias and is considered to be among the most recently established. 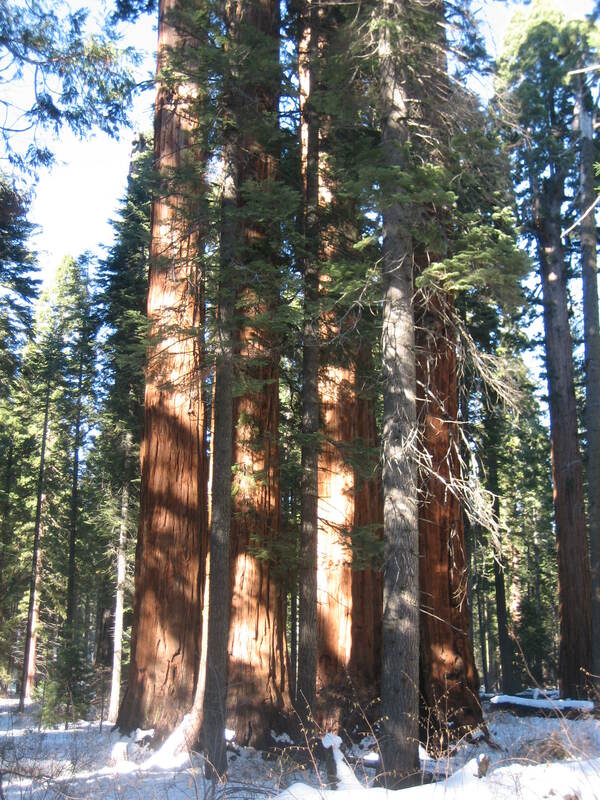 The sequoias are mainly south of Freeman Creek with approximately 800 large trees (10 feet in diameter or more). 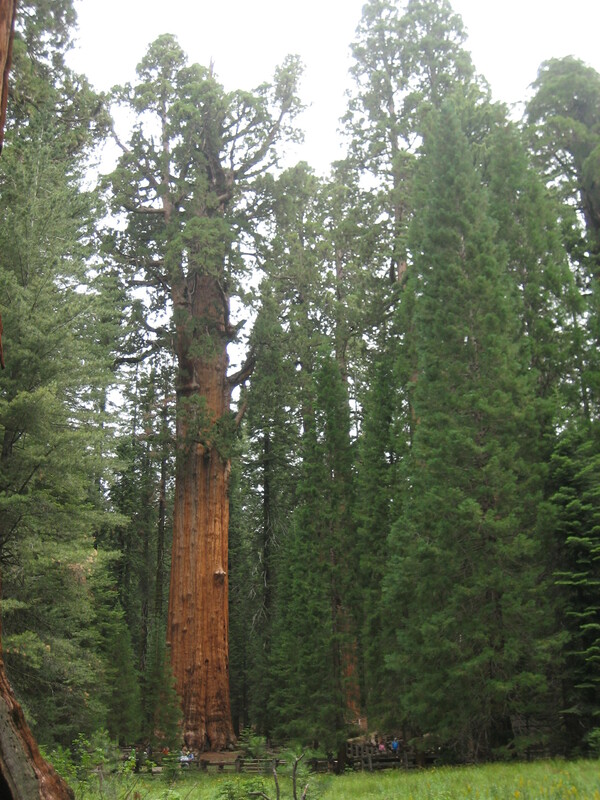 There are several large sequoias to see in this grove. Foremost among these is the President George H.W. Bush Tree. [t]here are a couple trees with a diameter of 20 feet, more than 100 with 15-foot diameters, and over 800 with 10-foot diameters. 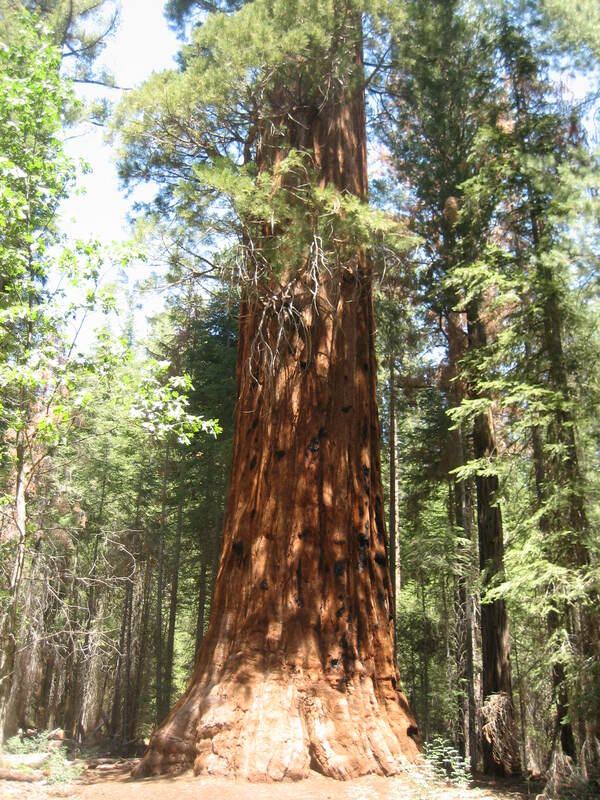 There are estimated to be over 2,000 sequoias with a diameter of over 5 feet in the grove. The largest tree in the grove measures 255 feet high with a diameter of 23 feet. The aforementioned National Geographic website explains how this tree came to be named after the 41st President of the United States. 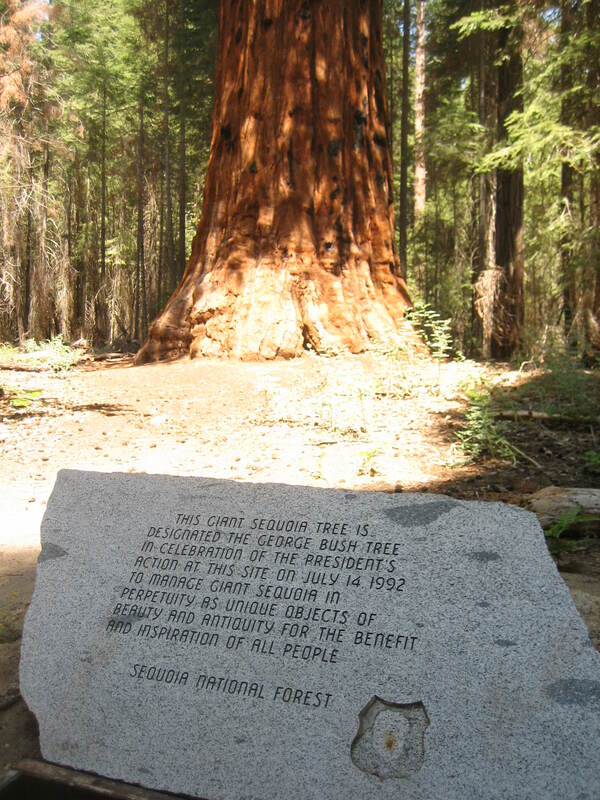 This tree was named for President George H. W. Bush in response to the proclamation he signed to protect all of the sequoia groves throughout the Sierra. President Bush himself signed the proclamation at this site. On the day I was trying to find the waterfall, I drove and drove and drove on Lloyd Meadow Road. 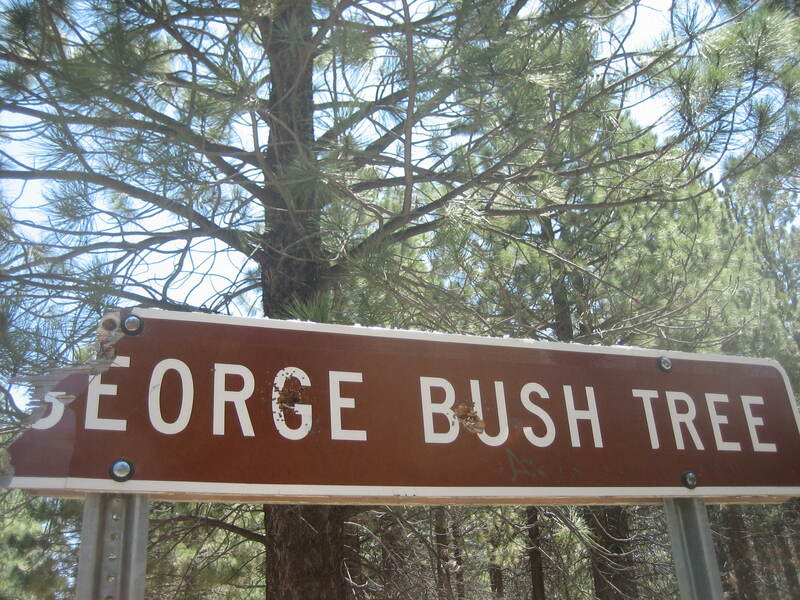 I never saw the waterfall or even a sign marking the trail to it, but I eventually saw a brown sign marked “George Bush Tree.” I figured I should go see the tree since I was there anyway. I turned down the decent dirt road (20S78) to the left of the brown sign. I drove about a mile down the road to the small parking area. There was no attendant and no fee to park. The start of the trail was marked with a carsonite. There was no indication of which way to go on the trail. The trail is a loop, and I started off in the direction that brought be around the back of the George Bush Tree. Since I didn’t see the stone plaque identifying the special tree, I didn’t realize it was the tree I had come to see. The first thing I noticed about the tree was a sort of Hobbit hole at the bottom of it. I went right over to investigate. Yes, it was just large enough for me to crawl into the hole and sit down, so I did. I felt very safe while I was inside the tree, as if the tree were protecting me. I spent some of my time enveloped by the tree enjoying the quiet of the forest. I sat still and listened to the birds and the breeze high above me. I sat in the tree and simply was myself, without moving or talking or thinking. I spent the rest of my time in the tree taking selfies. When I exited the tiny hideaway, I walked around to the front of the tree and realized this was the tree I was looking for! It is easy to identify the George Bush Tree from the front, because of the large stone marker. The aforementioned National Geographic webpage tells us what the plaque says. THIS GIANT SEQUOIA TREE IS DESIGNATED THE GEORGE BUSH TREE IN CELEBRATION OF THE PRESIDENT’S ACTION AT THIS SITE ON JULY 14, 1992 TO MANAGE GIANT SEQUOIA IN PERPETUITY AS UNIQUE OBJECTS OF BEAUTY AND ANTIQUITY FOR THE BENEFIT AND INSPIRATION OF ALL PEOPLE. 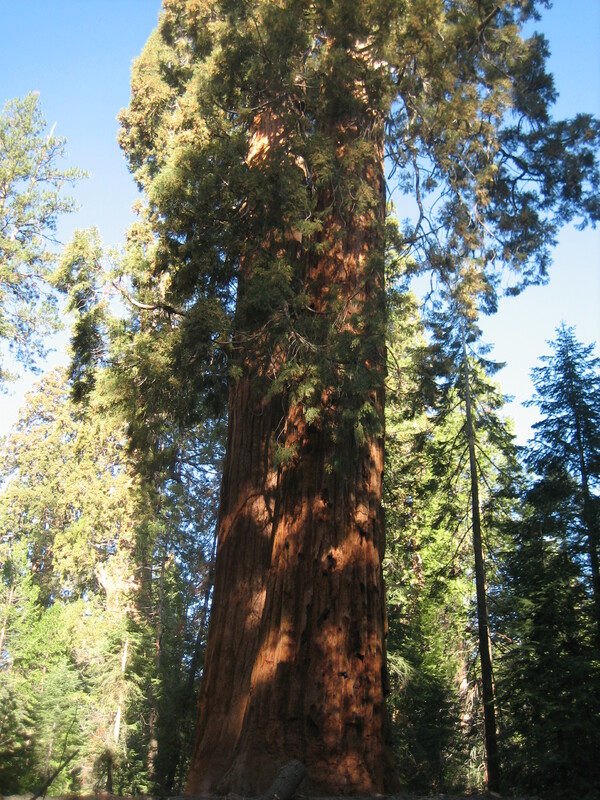 While the George Bush Tree is very big, it doesn’t even make the Wikipedia list of the 48 largest giant sequoias. According to the list, at least two other trees in the Freeman Creek Grove are larger than the George Bush Tree. The first of the two larger trees is the Great Goshawk at 255.2 feet (77.8 m) tall with a circumference of 90.2 feet (27.5 m), a diameter of 28.7 feet (8.7 m), and a bole volume of 32,783 cubic feet (928.3 m3). The second of the larger trees in the grove is the Bannister at 195.0 feet (59.4 m) tall with a circumference of 95.0 feet (29.0 m), a diameter of 30.2 feet (9.2 m), and a bole volume of 25,047 cubic feet (709.3 m3). The trail to the George Bush tree is unpaved, but I found it very easy to walk. I visited on a Monday morning, and I saw no other people on the trail or in the parking area. To reach the grove by paved road, you must travel from the south end. From the San Joaquin Valley Highway 99 take County Route SM56 east about 20 miles to California Hot Springs. At California Hot Springs, turn north on to SM50 (Parker Pass Road) continuing about 7.5 miles to Johnsondale. 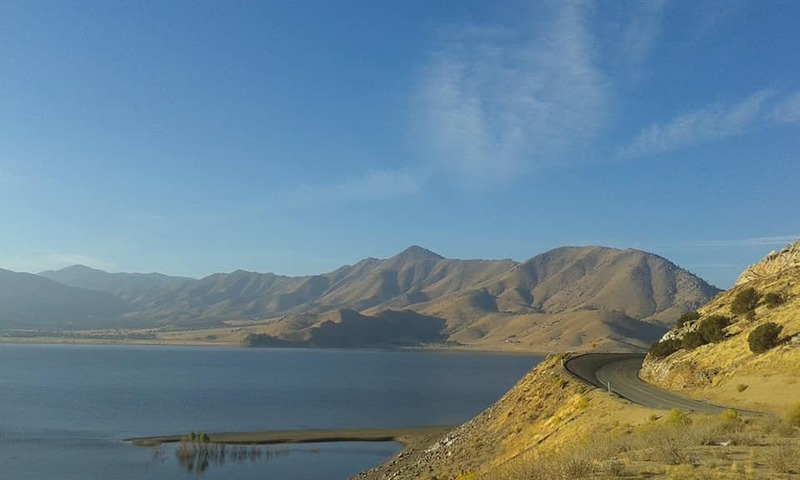 From the Kern Valley, take County Route SM99 (Mountain 99) northwest about 20 miles to Johnsondale. At Johnsondale is the junction with Forest Road 22S82 (Lloyd Meadow Road). Take FR22S82 right about 16 miles to the eastern end of Freeman Creek Grove. Another route from the San Joaquin Valley Highway 99 is on State Highway 190. Take Highway 190 east about 15 miles until the junction with Western Divide Highway (County Route SM107). Quaking Aspen Campground (GPS NAD 83: 36.12083, -118.54722), and the trailhead for FT 33E20 are also at this junction. The day I visited the George Bush Tree was a good day of exploration; not only did I see a named tree I hadn’t seen before, but I was also able to add Freeman Creek Grove to the list of giant sequoia groves I’ve visited. After twenty-one weeks on the mountain, today is the day I leave. Nolagirl says the trick to fighting off depression is to keep moving forward. Today I’m taking one step, two steps, three steps, four into the future. Goodbye mountain. I hope to see you next year. I made it to California. I made it through two days of boring (and dare I say, mostly useless) training. And then I made it up the mountain. I’m not yet stationed at my campground. I’m currently the temporary camp host at the campground next door to the parking lot for the trail. I’ll be there until the first of June, when the real camp hosts for that campground arrive (in a bus painted Ohio State colors, apparently). When I arrived at the campground, the gate was still closed. No signs were hung on the signboards. The women’s restroom up front was locked, and none of my keys opened it. The men’s restroom was unlocked, but filthy. I had no cleaning supplies. I had no toilet paper to stock the restrooms. I had no trash bags, and if I’d had any, I had no trashcans to put them in. On top of all of that, the crew who’d been in the campground cutting hazard trees had left tree debris everywhere. The campground looked like a war zone (or at least what I imagine a war zone in a forest would look like). I was not a happy campground host. Tree hazards include dead or dying trees, dead parts of live trees, or unstable live trees (due to structural defects or other factors) that are within striking distance of people or property (a target). 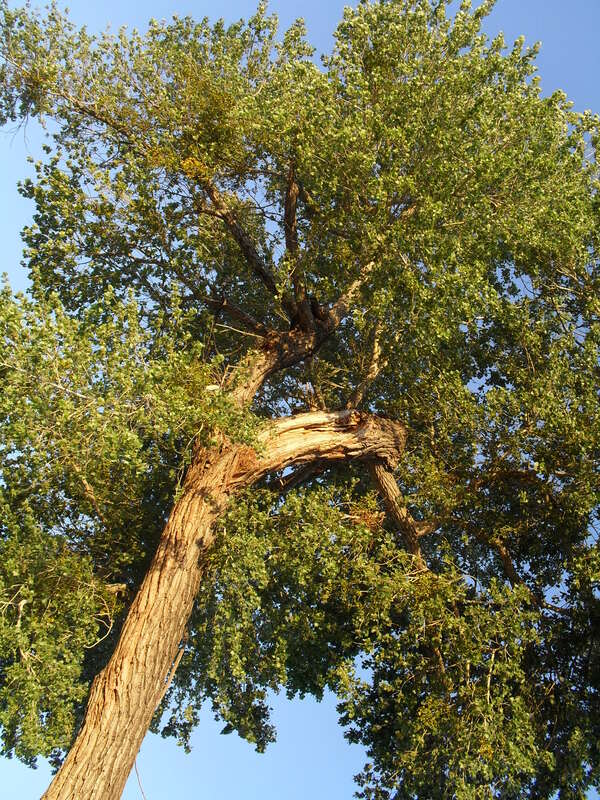 Hazard trees have the potential to cause property damage, personal injury or fatality in the event of a failure. I can’t vouch for what happens when a tree hits the ground and no one is there to listen (but I do have two words for you, baby: sound waves). When I was there to hear, falling trees were preceded by a huge cracking sound, followed by a reverberating thud. Such noise inspires awe, at least in me, but also in every other lay person who’s been standing near me when it’s happened. So because the trail was full of hazard trees and because Forest Service folks were in there cutting the hazard trees, the trail was closed. I didn’t talk to too many people about the trail on Thursday. The campground’s closed gate and the sign proclaiming Sorry, We’re Closed discouraged most people from even pulling their cars into the driveway. Some folks talked to the Forest Service employee stationed at the trail’s entrance. After the Forest Service guys went home (wherever home is to those guys), some folks parked on the road side of the campground’s gate to walk across the highway and read the sign warning of a possible $5,000 fine and six months in prison for anyone caught on the trail. I had resigned myself to fact that the campground would not be opened that day, when fairly late in the afternoon I saw two men and their motorcycles outside the gate. I walked over to talk to them, and one of the men said plaintively, Are you really closed? He seemed tired and frustrated. I told him we were closed. I suggested some other campgrounds down the road, but he said they’d already checked and found those campgrounds closed too. I explained the campground offered no toilet paper and no trash cans. I said I hadn’t been able to clean the restrooms. The man said he had his own toilet paper, could pack out his trash, and wouldn’t be offended by the state of the restrooms, as he had worked construction and was accustomed to portable toilets. After we talked awhile and I realized they were good guys, I decided What the hell, opened the gate and told them they could stay. They ended up staying three nights. Both of them were super nice guys, and I had several pleasant conversations with both of them. It was awesome to start the season (before the season had officially started) with nice campers. I was able to officially open the campground on Saturday morning. People started coming through the gate before 11am. I did get one set of campers (a couple and their two dogs, none of whom gave me any trouble), but most of the people coming through the gate had come for the trail. After scrubbing the two front restrooms, I posted myself near the gate with a book. As car after car pulled in, I answered the questions of the visitors. Yes, the trail is closed. It’s closed because their are many hazard trees on the trail. The Forest Service is in the process of cutting down the hazard trees. It’s dangerous on the trail. The drought killed the trees. Well, the drought and the bark beetle and some kind of mold. But mostly the drought. 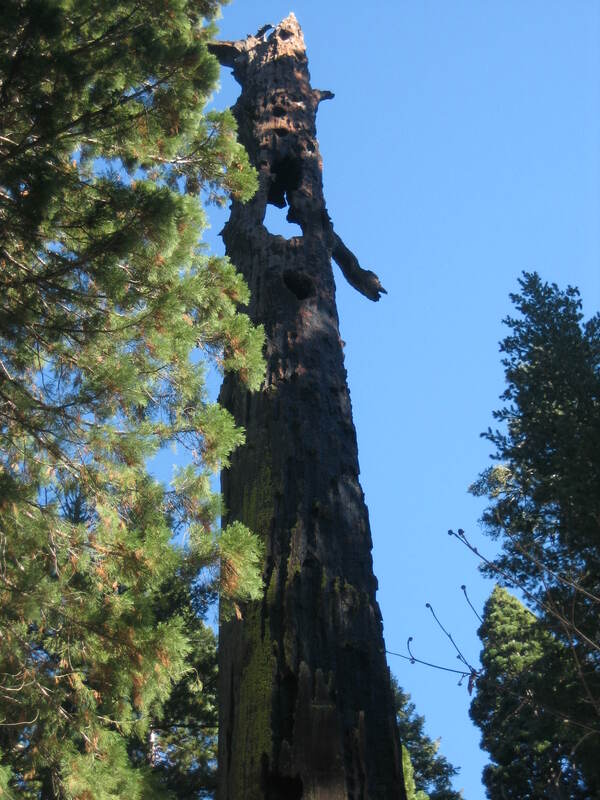 Because of the drought, the trees’ defenses were down and they couldn’t fight off the bark beetle and the mold. Yes, the campground is open. Yes, the restrooms are open. These up front are wet because I just cleaned them, but you are welcome to use the ones at the back of the campground. There are giant sequoias in the campground. (pointing) There’s one. (pointing) There are three over there. (pointing) There are four over there. You are welcome to park your car and take a look around. I also gave a lot of people directions to the next grove of giant sequoias, about twenty miles away. Sunday was a little slower, but otherwise the same. The highlight of Sunday was another set of nice campers, this time a family recently moved to Tucson with a Grateful Dead dancing bear sticker on the back window of their Volvo. They asked me questions about the trees in the campground, and I got to give my talk about the differences between giant sequoias and coastal redwoods. So now I’m on my second of two days off and will go back up the mountain in a few hours. I don’t know what the state of the trail will be when I get back up there. Forest Service workers were there cutting hazard trees on Sunday. (Today’s our Monday, the young man monitoring the closed entrance to the trail told me cheerfully.) 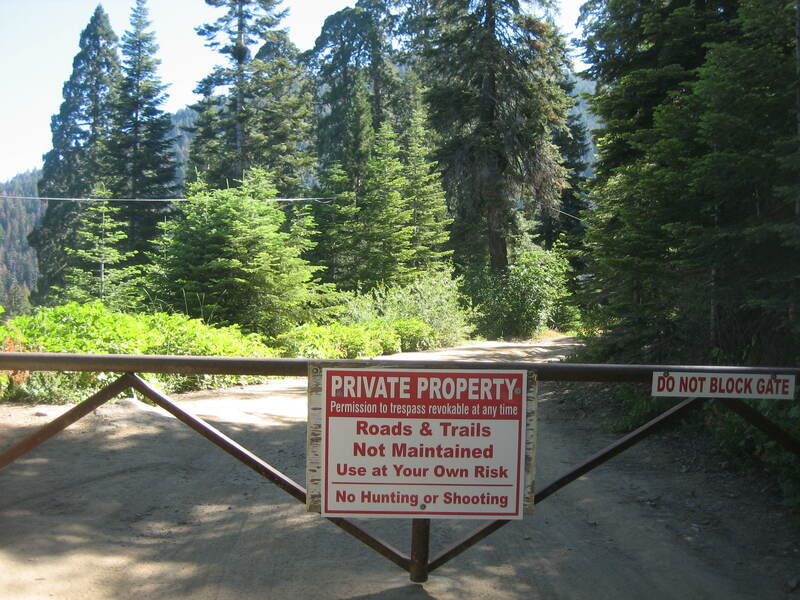 Last I heard, the Forest Service was planning to have the trail closed through the end of the month. Yep, closed for Memorial Day. If that’s how it works out, guess who’s going to get to talk to hundreds of disappointed visitors during the three-day weekend. If you guessed it’s going to be me…you are correct. If you also guessed this is a duty I am not pleased about, you’d be correct about that too. 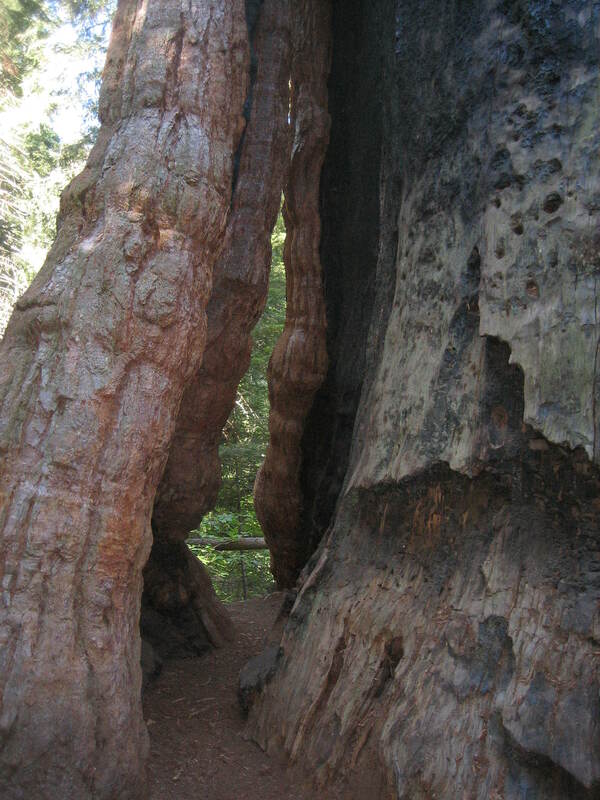 I took this photo of two giant sequoias which grew together and fused over hundreds (maybe thousands) of years. 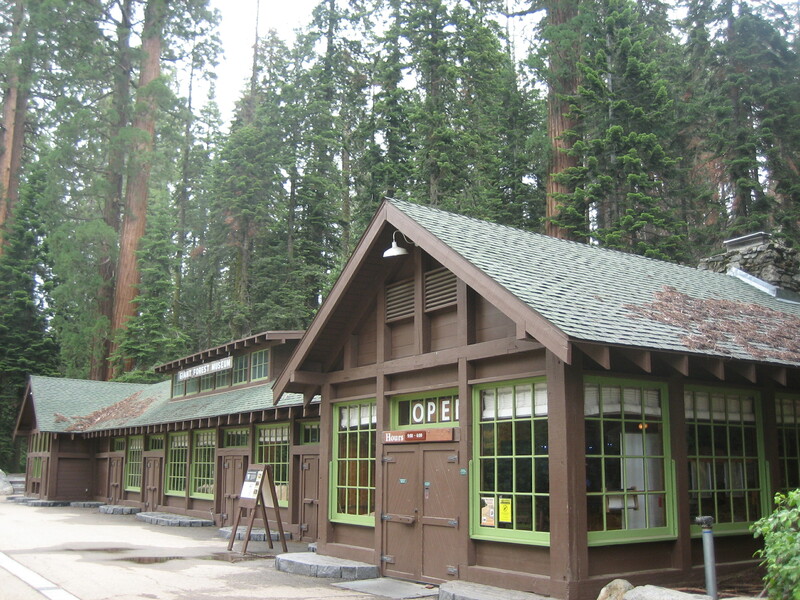 The grove is in the Sequoia National Forest, near the small community of Pine Flat. 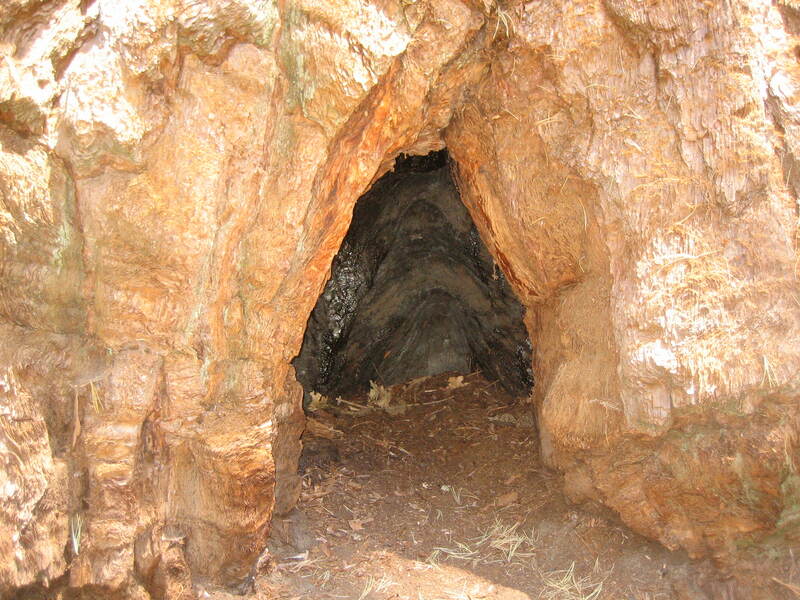 It is a couple of miles from the California Hot Springs community. I visited Deer Creek Grove early one morning when I was in the area in the summer of 2015. To get to the grove from Mountain Road 50, go straight (onto Mountain Road 56 toward Pine Flat) when Mountain Road 50 ends at Mountain Road 56. From Mountain Road 56, turn right when the road dead ends at Mountain Road 50. A sign labeled “Deer Creek Grove” will point you to a left turn onto forest road 23S04. Follow that winding gravel and dirt road for several miles, through ranch land, then forest. The road ends in a gravel parking area at the lower edge of the grove. When I visited, there was no sign, nothing other than the parking area and a dilapidated picnic table in a clearing to indicate that I had arrived. Unlike other trails through (the admittedly few) sequoia groves I’ve visited, the trail through Deer Creek Grove is a real hike. The path is barely visible, marked only by other feet that traveled on it in the past. Some parts of the trail are on a somewhat steep incline. I thought I was in decent physical condition when I tried to hike through this grove, but I was soon huffing and puffing and panting as I ascended. I wasn’t prepared for a real hike when I visited Deer Creek Grove. I was wearing a skirt when I really needed long pants to adequately protect my legs. I also really needed my walking stick to help me up the steep parts of the trail, but I’d left it in the van. I should have used a backpack to carry water instead of holding my bottle in my hands. I hadn’t been planning on mosquitoes either, but they were out in force, biting the hell out of me. The only bug repellent I had was some hippy dippy oily Tom’s of Maine stuff which made my skin greasy, but did absolutely zero to deter the mosquitoes. I didn’t stay in the grove very long. I didn’t hike the entire trail (which Willard says “…passes by all the grove’s good-sized trees”). I just wasn’t having much fun, so I decided to backtrack and leave. I did get a few nice photos before I left. I took all photos in this post. At my jobs as a camp host and parking lot attendant, I am asked a lot of questions. After over three months, I’ve heard some questions so many times, they no longer surprise me. Here’s a list of questions I am asked repeatedly (and my most common answers). Some questions take me by surprise. One day a young Asian woman with a fairly strong accent asked me if we had a resting room. I thought she meant restroom (toilet, WC, el baño), so I told her it was in the little building in the middle of the parking lot. She was clearly exasperated and said not a restroom, a resting room. I was perplexed and just looked at her. She explained she wanted to leave her mother, an elderly woman using a cane, in a resting room with chairs and shade. I guess she wanted a waiting room. I told her there was no resting room in the parking lot, and she clearly expressed additional exasperation. I didn’t even try to explain to her that the only rooms in the area are the two with the toilets and a tiny one for storage. Another time, a family asked me how to get to the Big Chief. I knitted my brow and shook my head. (I do something with my mouth too, when I don’t know the answer, but I don’t know how to explain the expression.) I told them I’d never heard of it. 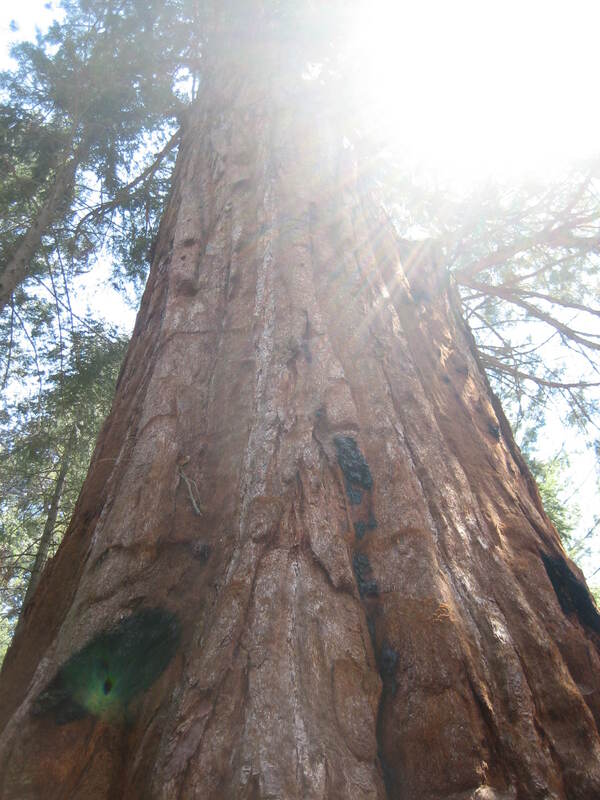 They said it is the 7th largest giant sequoia, and it’s supposed to be in the area. I still had no information about its location to offer. One Thursday was the day of weird questions. Later that day, I did pull out my map for a family to look at. The man asked me about the Pinnacle Trail. I said I’d never heard of it. He allowed that he possibly had the name wrong. I offered the map to him. He found the trail for which he was looking (the name of which has two syllables and does not begin with the letter “P”). They had a bunch of questions about the trail. I told them I’d never hiked it and could only say what I’d heard about it from other people. They kept asking me questions, and I kept saying I don’t know. Finally the oldest kid said, Are there big trees on the hike? I said, I don’t know; I’ve never been there, and I was done with them. Sometimes people insist I answer their questions, even after I’ve told them I can’t. That afternoon I was patrolling at the nearby campground, and two men flagged me down to ask about the yurts. After I answered their questions ($75 a night, sleeps five, no cooking inside, bring your own bedding), they wanted to know about the closest rivers. I told them about the two rivers in the vicinity, and one guy asked me if the fishing were good. I said, I don’t know. I don’t fish. It seems to me he should have first asked me if I’d fished either river recently. The strangest (or at least most strangely phrased) question of the day happened back at my campground. I was checking in two young Asian men (brothers). I pointed out my van and told them to let me know if they had any questions or problems. The one doing the talking asked if I stayed in the campground, and I said yes. The he asked, If someone arrives late at night, will you be here to assist them? I told him I would be here if someone arrived late, but when people arrive after dark, I stay in my van and check them in the next morning. I wondered what kind of assistance he had in mind. There are definitely certain kinds of assistance I will not provide! The shuttle I took from Visalia, CA to the Sequoia National Park dropped me and the other passengers at the Giant Forest Museum, so I decided to start my day there. This is the building which houses the Giant Forest Museum. I think the museum is intended for people who don’t know anything about sequoias because the information presented seemed pretty basic to me. One exhibit I did find informative was the comparison of giant sequoias and coast redwoods to other trees and things like the Statue of Liberty and skyscrapers. I also enjoyed the pound of giant sequoia seeds in a large plastic jar. The sequoia seeds look so much like oat flakes that when I saw the jar, I thought Why did someone leave a jar of oatmeal there? Upon closer inspection, I realized I was actually looking at over 80,000 giant sequoia seeds. The Sentinel Tree stands outside the Giant Forest Museum. The Forest Service schtick for the Sentinel Tree is how average the tree is. 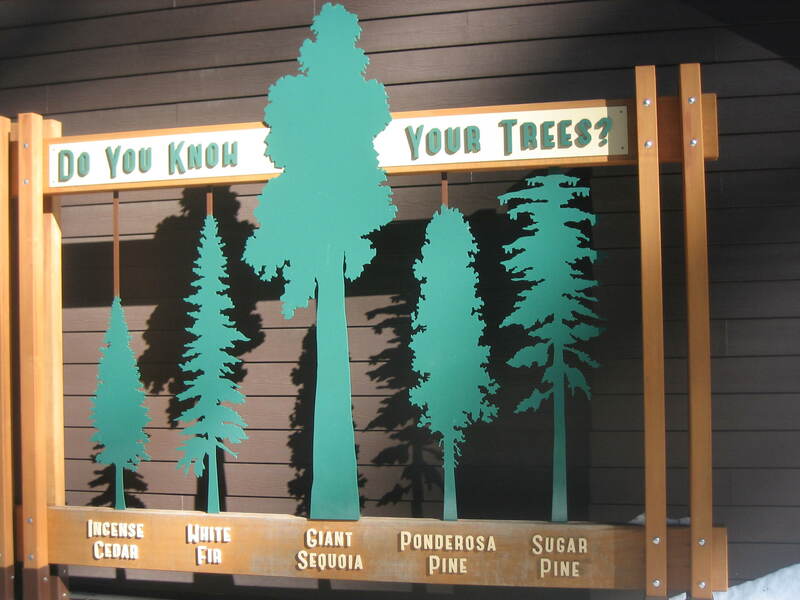 The informational sign goes something like this: You think this tree is big, don’t you? 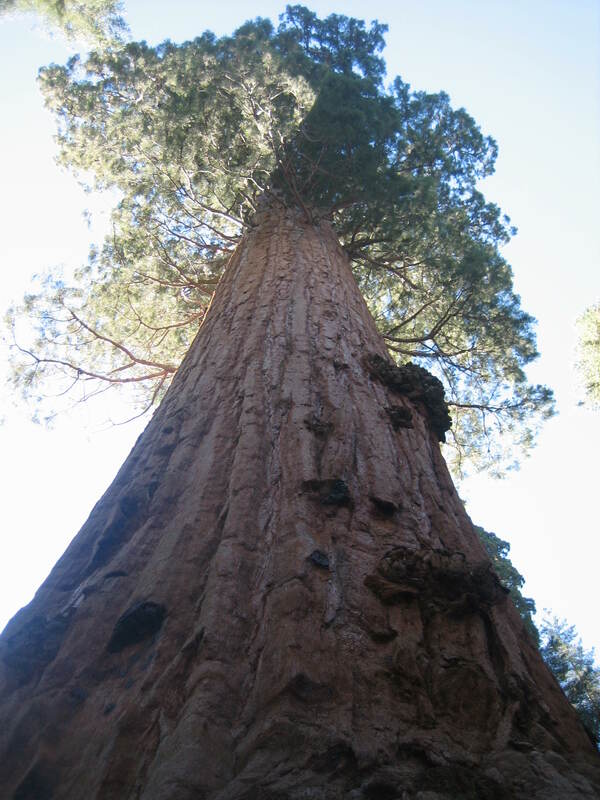 In fact, it’s just an average size giant sequoia. It weighs more than two fully loaded jumbo jet airplanes–700 tons–but it’s just average! Ha!Ha! Tricked you! This tree’s not so big after all. There are bigger trees around here. 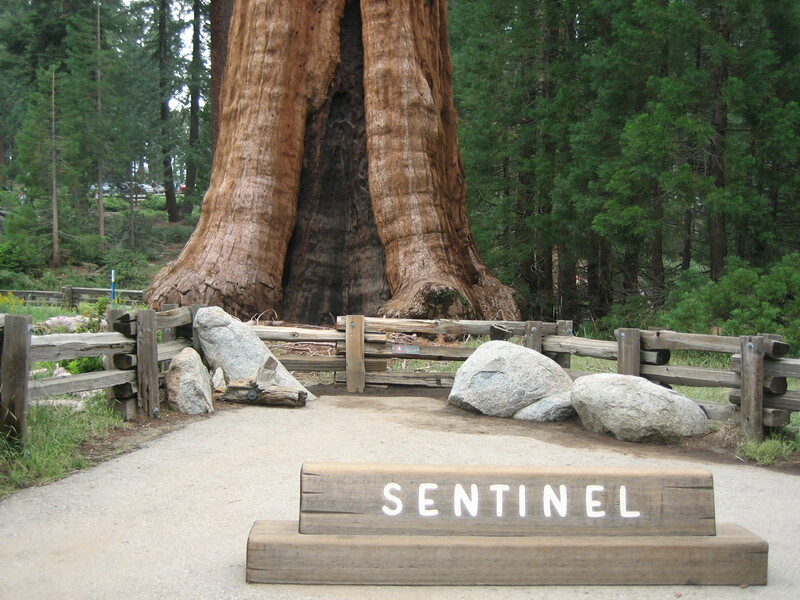 According to http://www.hikespeak.com/attractions/giant-forest-museum-sequoia/, the Sentinel Tree is about half the size of the General Sherman Tree. There are two lines on the ground outside the Giant Forest Museum representing the Sentinel Tree. 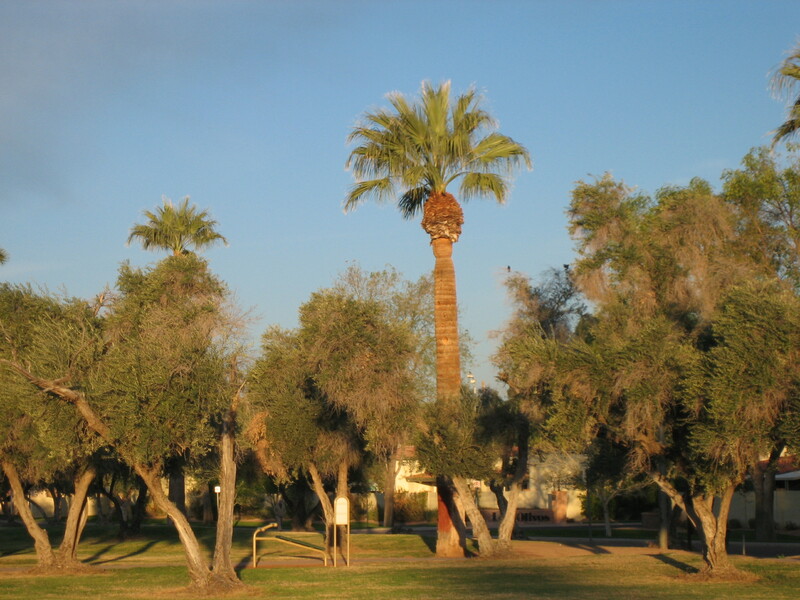 One shows how wide the base of the tree is, and the other shows how tall the tree is. By walking along the line representing the height of the tree, a person can pretend s/he is climbing the Sentinel Tree. Every twenty or so feet, there is a metal tile with a drawing showing the height represented and the width of the tree at that height. I was walking that line, metaphorically climbing the tree, when the rain started coming down hard, sending me into the Giant Forest Museum for the second time that day. After the museum closed and I was waiting outside for the shuttle to pick me up for the ride back to Visalia, tourists started hopping the fence around the Sentinel Tree so they could have their picture taken with it. The older couple who’d been working at the gift shop in the museum tried to tell the first group (teenage boys) why they should stay off the tree’s side of the fence, but the mother of the boys was the one with the camera, and she would not be swayed from getting the photo she wanted. Later, as the photo family walked near me to get to their car, I heard them laughing at the improbability of their actions killing the tree. Humans can be so short-sighted while imagining their own specialness. The whole view of the Sentinel Tree. 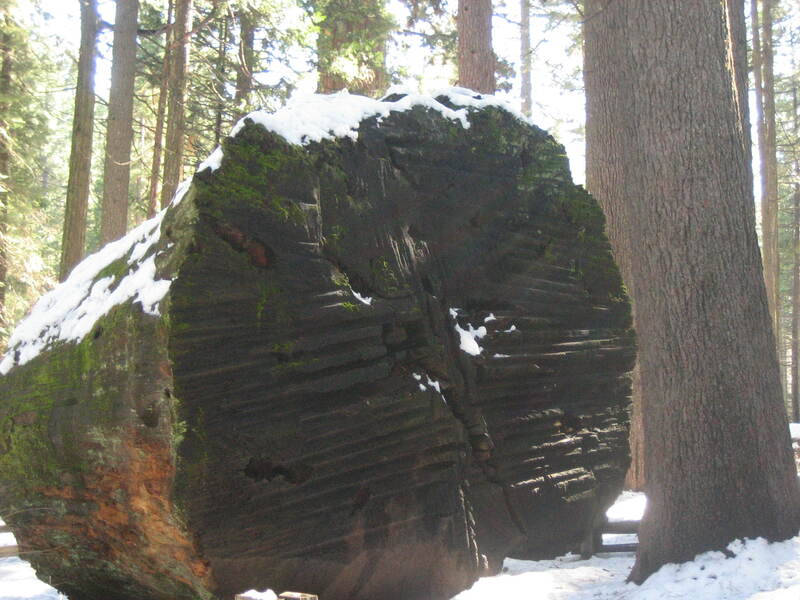 Read more about giant sequoias.